Both timeless and eminently sensible, The James Beard Cookbook is the go-to book for twenty-first-century American home kitchens. I have a crush on James Beard! I tried 3 recipes from the book so far and love it! Especially the first one I tried, the angel food cake... omg... amazeballs! First, let me tell you how great this book is. James goes into detail about so many different food, and how to prepare them. Even the easy stuff. He shows you how to make it easier and more delicious. Remember this is the chef that other chefs vie to get a James Beard award. That shows you that this guy knows his stuff. This is literally the best cake I have ever had, let alone made. This Angel Food cake is the whole reason for my crush. Ladies, I know you feel me here. James tells you not to ice the cake, and once you bite into this spongy deliciousness, you know why. It is sweet enough on it's own and pairs great with coffee. This is going to be a cake I make often. 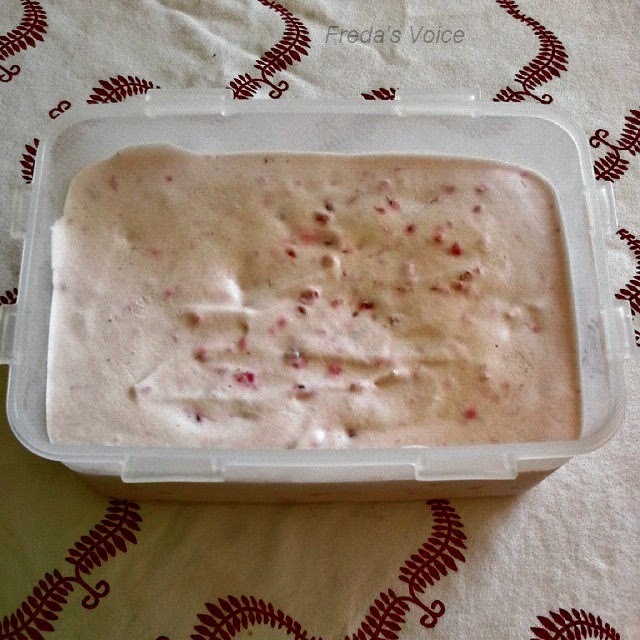 Then I made Raspberry Cream Freeze. It was delicious too. Still, I'm a knob. The recipe said not to let it get too hard, and what did I do. Yup. Had to let it sit for a bit... but it was tasty. At least I know for next time that you really need to watch it. Lastly I made Barley Casserole with mushroom and bacon compote. Now this was friggin' amazing and I didn't know if I would like it or not. Course I made Tbone Steaks with it so that paired well. I was worried when I saw a couple on top that didn't look cooked, but it was. The hubby really liked this one. He is a huge barley fan and wants this again. He actually ate most of it, going back for thirds!! I just have to add, I swapped out almonds for bacon in the compote. I am tired of almonds, another story there all together, but am glad I went with bacon. Everything is better with bacon! I know every single one of you will love something about this book. There was stuff to cook I have never been near before, and that kind of appealed to the adventurous cook in me. I hope you will get a copy and be more adventurous too! **No compensation was received for posting. Compensation will be earned if purchases are made from the links within. An ecopy was provided to facilitate a review. Opinions are photos are owned by this site. The recipes look great--I can't believe it's already been around 50 years! Yum Yum!I love cook books and these are some delicious recipes.